An outburst of the erupting emotions that traced their path to nib. All regrets sink in my bleeding heart! That is not so long gone! That chain me to move on! Heart that bleeds in vain. Let the time stab me again apart. And fate be painted off my bleeding heart! Where gloom is never hung. That might come up glum. Coz I already got a heartbleed. Let the time stab me all apart. 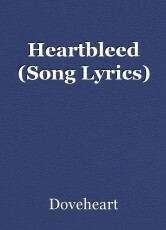 Let it warp around my bleeding heart! Where justice would give in. To the sound of chortle. Off my transient nib immortal. Nurtured be it by my heartleed. Yes I got a heart to bleed. © Copyright 2019 Doveheart. All rights reserved.